Learner activity control made easy. Powerful online medical education learner management and assignment activity controls for clinical training programs and medical education directors. Monitor uptake, compliance, and performance outcomes across all learners and locations on a single screen. Step-by-step Assignment Wizard makes assignment management “out of the box” easy. Program Directors can utilize calendar and Gantt chart views to lay out a series of assigned activities, manage timelines, and better avoid training conflicts. Calendars help organize dates while Gantt longitudinal charting helps show concurrent assignment dates, helping administrators avoid bottlenecks and overloads. Give yourself and your learners a better idea of what to prepare for by scheduling assignments out months in advance. 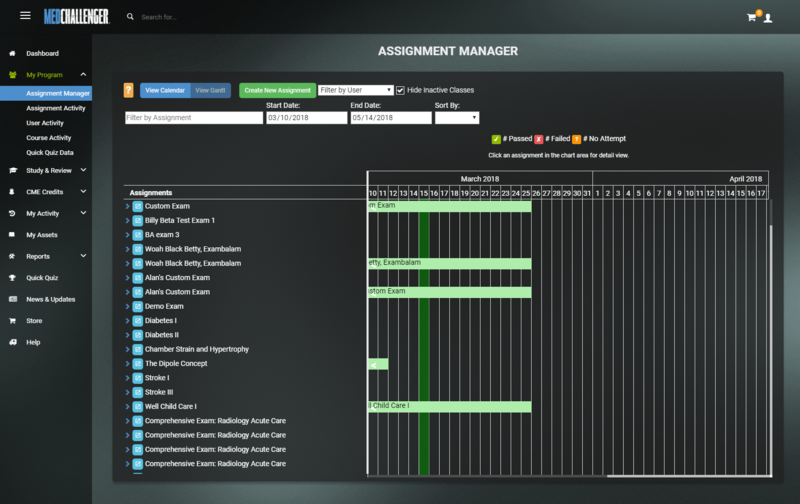 If changes are needed, you can modify assignments on the fly at any time. Get to individual details and modify assignments on the fly. 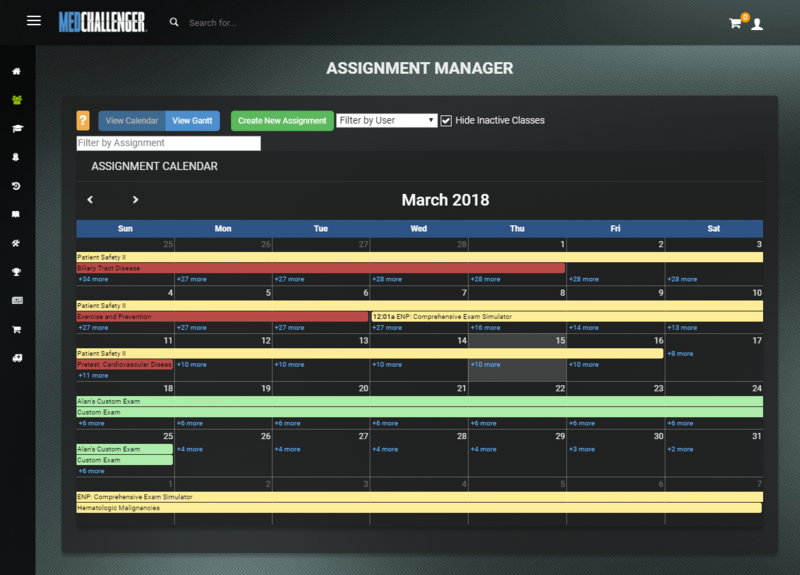 View your learners’ progress as a group or individually, and edit and manage independent assignments quickly, simply by clicking on the chosen assignment and adjusting the settings. Set activities, post-assessment behaviors, and track performance. We know education directors not only need quality content and testing – they need reliable, flexible, and intelligent tools to control education activities and compliance from anywhere. Med-Challenger Assignments was designed with this in mind. Assignment options are versatile, easily customizable, and numerous. Need to set a specific time limit on one of your assignments? You got it. Want your learners to have access to the answer key after completion? You can do that, too. The list goes on and on. What all can I do when setting up assignments? Set the due date, decide how long you’d like the assignment to be effective, & choose whether or not these settings apply to all assignments. Decide whether or not you’d like to allow your learners to retake assignments, and set the number of attempts. Would you like the assignment to be timed? If this setting is enabled, the assessment is automatically scored when time expires. Choose the course you desire – filter by chapter or topic – and select specific exams from within the chosen course – or even assign Custom Exams. Issue the same assessment/exam to all assignees, or assign them individually or by group. The suggested passing score is set at 80 – set the bar higher or lower to fit your needs. Decide if your learners receive notifications on the date the assignment is created, when they can start the assignment, both, or neither. Decide if you’d like to receive notifications when each assignee completes an assignment, when an assignee fails to complete an assignment, and/or on the date the assignment is due. 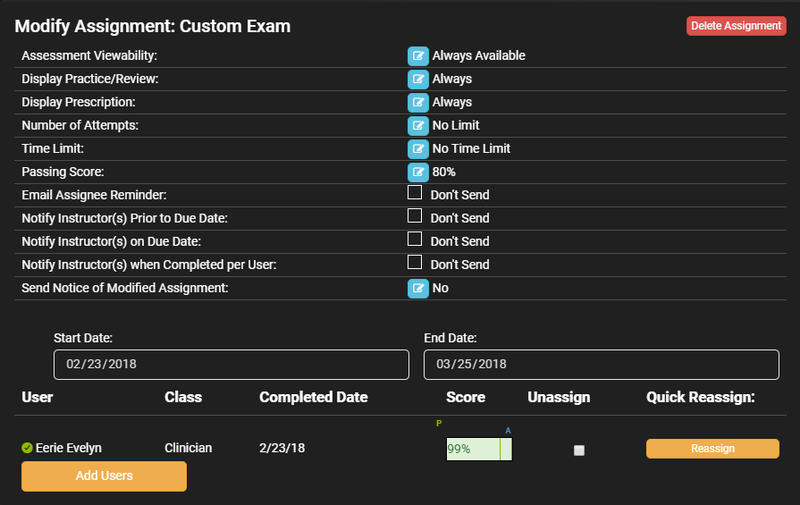 Build and Assign Custom Exams too! Our custom exam builder gives program directors the ability to create custom exams, save them, and use them as assignments for their group. Prioritize remediative instruction by understanding areas of shared difficulty and maximize your training time. 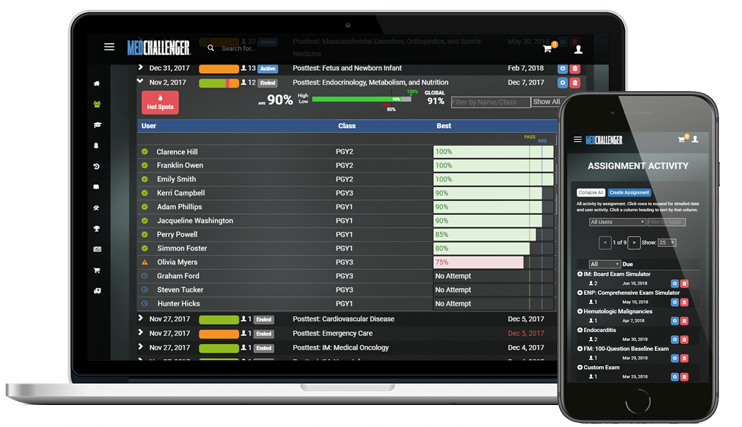 In addition to pain-free control and assessment of your group, Med-Challenger’s Assignments feature gives education directors a bead on any areas of shared knowledge deficiency.